After loading up the disc, if you have the Blu-Ray, and have 5.1 surround sound then the first thing you need to do is go to the Settings option on the menu and select that for the option to turn 5.1 sound on (standard stereo is enabled as the default). I thought this was rather disappointing - a lot of people will ignore the settings and just play the disc, and in that case they'll miss out on the improved sound that Blu-Ray allows. It would have been far better if the sound options were displayed clearly on the menu screen so people don't miss it. The main part of this Disc is the concert. 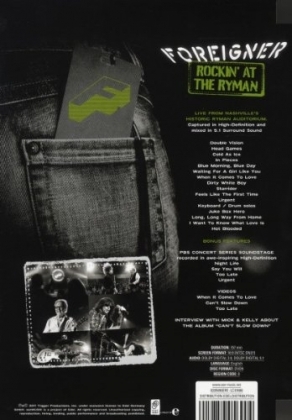 The concert was filmed at the historic Ryman Auditorium in Nashville (best known as the Grand Ole Opry) in March 2010 in high definition, and as you'd expect, the picture quality and sound quality are both excellent. The concert is around an hour and three quarters in length with 15 songs. The setlist includes two songs from the 2010 album "Cant slow down" ("In pieces" and "When it comes to love"), alongside a host of classic songs. Foreigner fans will enjoy this disc - and people who don't know they are Foreigner fans will as well. Foreigner are one of those bands that if you ask most people to name any of their songs then people would struggle to name any, but once they hear the songs then they'll be surprised just how many they recognise and like. Songs like "Cold as Ice", "Waiting for a girl like you", Jukebox hero and "I want to know what love is" are instantly recognisable and most people will know them, even if they didn't realise they were by Foreigner. 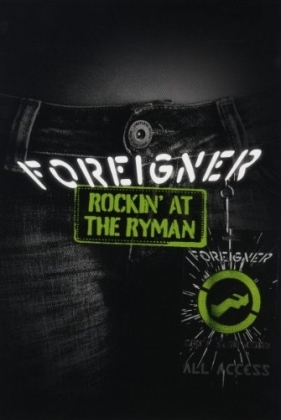 When I saw Foreigner at the High Voltage festival in 2010, I could hear a lot of people making comments like "Oh I love this song, but I didn't know it was Foreigner"
The concert is extremely good - the new songs stand up well against the older material. New singer Kelly Hansen has a great voice and handles the old classics with ease. Some of the video editing effects seem to have been used just for the sake of it - the blue wash works well with "cold as ice", but some of the split screen bits and the vintage black and white effect used later on in the concert actually detract from the enjoyment of it as far as I'm concerned. As well as the concert, the disc includes two "interviews", which in reality are just Kelly Hansen and Mick Jones talking separately about the album in general and in the other interview, going through the "Can't slow down" album track by track and talking about each in turn. There are also music videos for three tracks from the "Can't slow down" album. The final bonus feature is the "PBS concert series soundstage" - four songs recorded live in High definition, with Jason Bonham on drums. This is a good value package - a full length concert, plus all the bonus features. With plenty of great music, high quality sound and picture, this is a disc most Foreigner fans will want to own.